The next member of the Deck Build Pack series is announced. The latest “Official Card Game” Booster Pack of the “Deck Build Pack” series, that makes it easy to build Decks of multiple themes, is being announced for release on February 23rd, 2019. With this pack, you can obtain new cards of three different types of themes, and get your hands on necessary and versatile reprints that you’ll need to help build the Decks in this pack. Further news will be in V Jump and further publications. 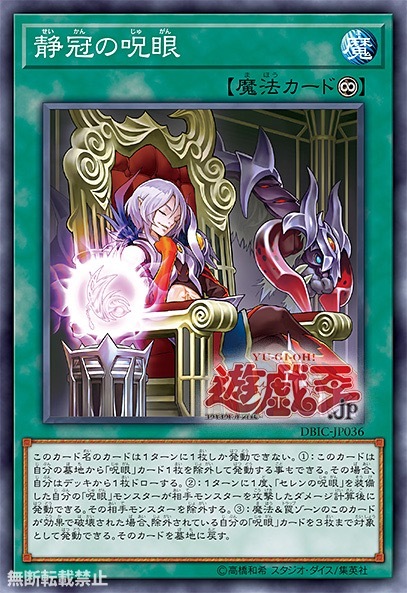 ◾ Introduces the "Evil Eye", "Infinite Ignition" and "Witchcraft" archetypes to the TCG. DBIC-JP027 "Serziel, Watcher of the Evil Eye"
DBIC-JP028 "Medusa, Watcher of the Evil Eye"
DBIC-JP030 "Bajilius, Retainer of the Evil Eye"
DBIC-JP031 "Zerachiel, King of the Evil Eye"
DBIC-JP032 "Evil Eye of Selene"
DBIC-JP033 "Pareidolia, Domain of the Evil Eye"
DBIC-JP034 "Forbidden Awakening of the Evil Eye"
DBIC-JP035 "Curse of the Evil Eye"
DBIC-JP036 "Watchful Rule of the Evil Eye"
DBIC-JP037 "Jealous Disruption of the Evil Eye"
DBIC-JP038 "Death Control of the Evil Eye"
DBIC-JP039 "Sentence of the Evil Eye"
You can only use this card name’s (1) and (2) effects once per turn each. 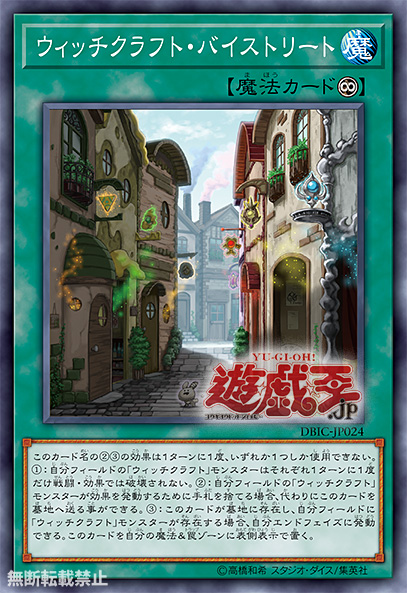 (1) During the Main Phase (Quick Effect): You can Tribute this card, then discard 1 Spell; Special Summon 1 “Witchcraft” monster from your Deck, except “Witchcraft Poterie”. (2) If you have no cards in your hand: You can banish this card from your GY, then target 1 “Witchcraft” card in your GY; add that card to your hand. 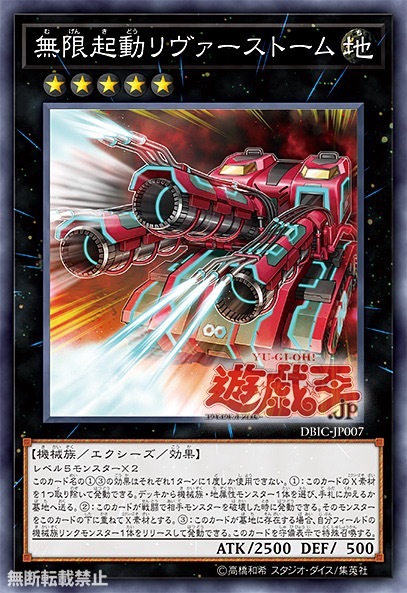 You can only use this card name’s (1) and (2) effects once per turn each. 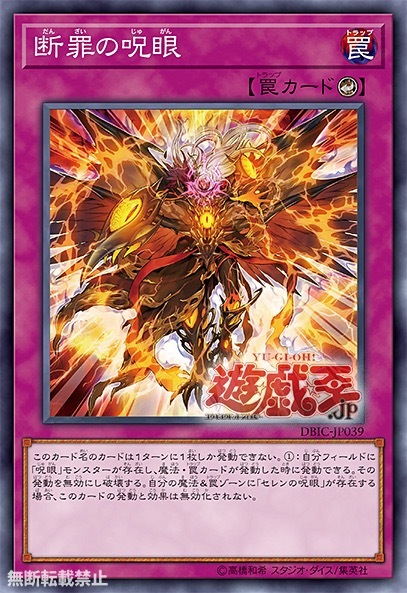 (1) During damage calculation, when a Spellcaster monster you control battles an opponent’s monster: You can reveal any number of Spells with different names from your hand, and if you do, that monster you control gains 1000 ATK/DEF for each card revealed until the end of this turn. (2) (Quick Effect): You can discard 1 Spell; negate the effects of all face-up monsters your opponent currently controls until the end of this turn. You can only use one effect of this card’s name per turn, and only once that turn. 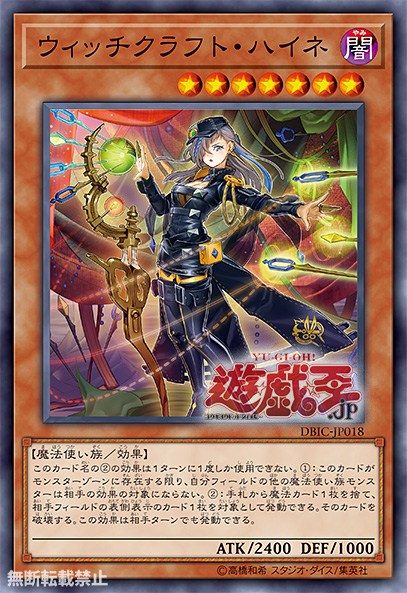 (1) Target 1 “Witchcraft” monster in your GY; Special Summon that monster (2) During your End Phase, if you control a “Witchcraft” monster while this card in the GY: You can add this card to your hand. You can only use one effect of this card’s name per turn, and only once that turn. 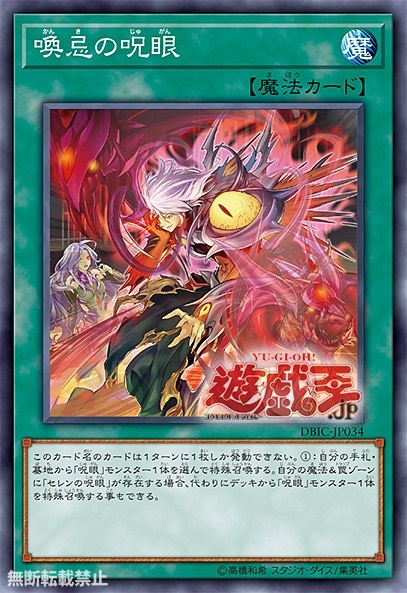 (1) Target 1 “Witchcraft” monster you control; during this turn, that monster can attack twice during each Battle Phase, also if that monster attacks, your opponent cannot activate Spells or Traps until the end of the Damage Step. 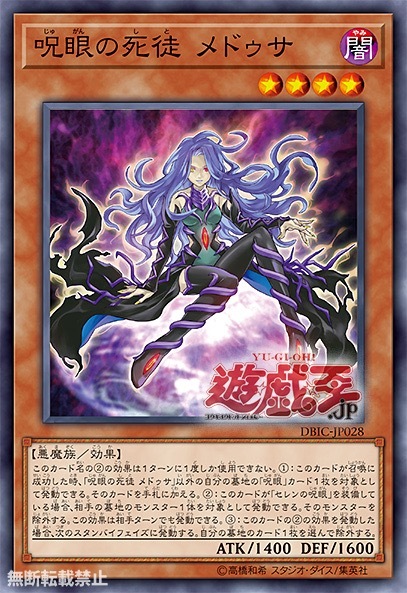 (2) During your End Phase, if you control a “Witchcraft” monster while this card in the GY: You can add this card to your hand. You can only use one effect of this card’s name per turn, and only once that turn. 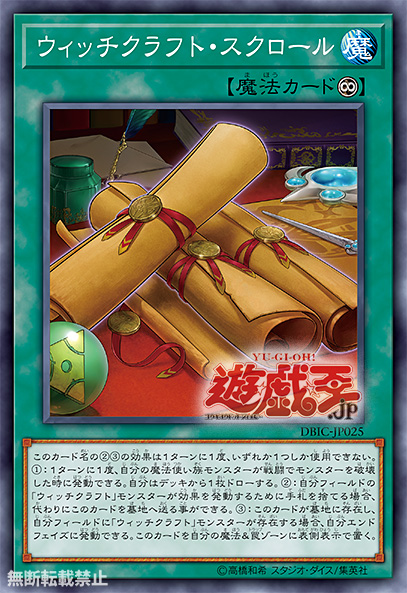 (1) Target Spell/Traps your opponent controls, up to the number of “Witchcraft” monsters you control; return those card(s) to the hand. 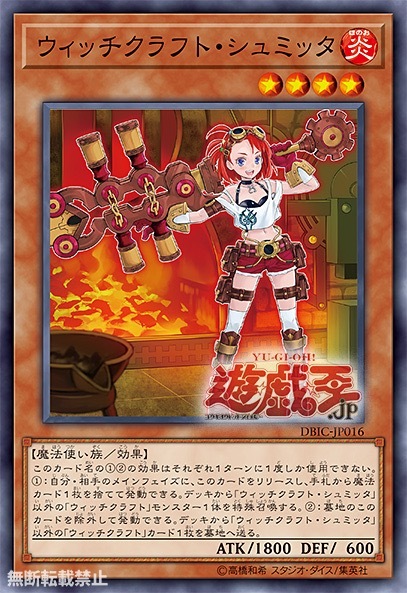 (2) During your End Phase, if you control a “Witchcraft” monster while this card in the GY: You can add this card to your hand. 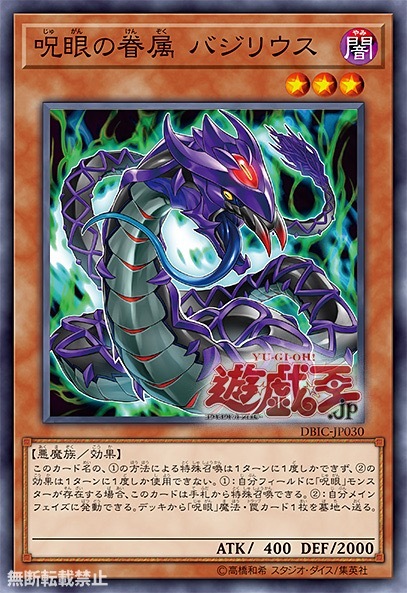 (1) The equipped monster cannot be destroyed by battle or your opponent’s card effects, also it cannot be targeted by your opponent’s card effects. (2) Each time you activate the equipped monster’s effect, or activate another “Cursed Eye” Spell/Trap Card: The equipped monster gains 500 ATK, and if it does, you lose 500 LP. 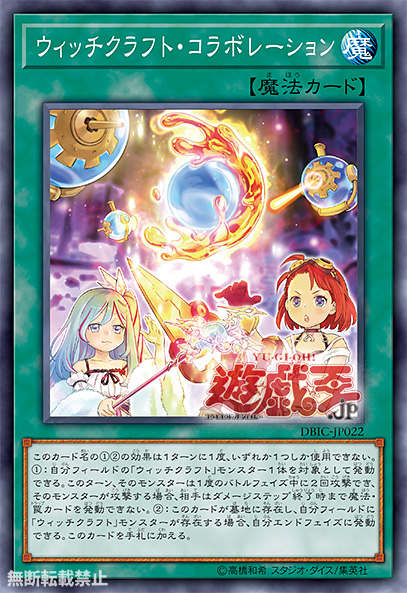 (3) If this card is in your GY: You can pay 1000 LP, then banish 1 “Cursed Eye” Spell/Trap from your GY, except “Cursed Eye of Selene”; Set this card. (1) When this card is activated: You can add 1 “Evil Eye” monster from your Deck to your hand. (2) Once per turn, while you control “Evil Eye of Selene” in a Spell/Trap Zone, when an “Evil Eye” monster you control is attacked, during damage calculation: You can activate this effect; damage you take from this battle is also inflicted to your opponent. 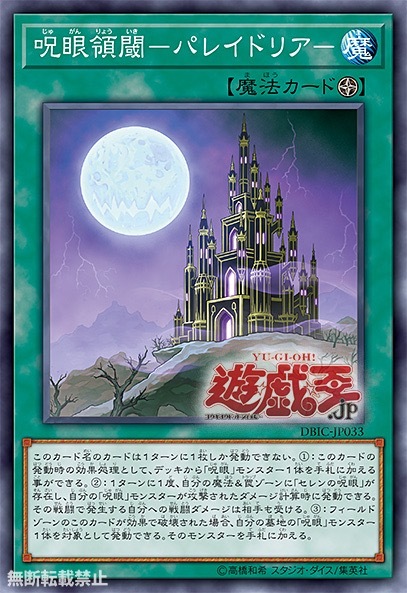 (3) If this card in a Field Zone is destroyed by an effect: You can target 1 “Evil Eye” monster in your GY; add that monster to your hand.